The Temple of Emerald, located in Bangkok and attracting thousands of visitors each day, is an architectural symbol of Thailand. Arguably one of the most photographed landmark in the country, it is no surprise that many artists have taken upon its wondrous beauty as the focal point of their artwork. Known as Wat Phra Kaew to the people, the glorious ornamented temple’s aesthetics ignite a spiritual awakening to an artist’s inspiration, thus, resulting in an artwork that emanates divinity and peace. Among the artists who have succumbed to their muse from witnessing the magnificence of the Temple of Emerald are artists like Choo Keng Kwang and Chia Yu Chian. CHOO KENG KWANG An ethereal art master Born in 1931 in Singapore, Choo Keng Kwang is a beloved first generation artist and is the pride jewel of his country. Choo gained his well-deserved and exceptional reputation through his extraordinary traditional oil paintings of landscape, animals and nature, inspired mostly from his travels and exposure. A highly accomplished painter, a committed educationist and a generous supporter of social charities, his contributions and efforts since the 1950’s have made him a cherished icon in the world of art. Choo has had the privilege of holding and participating in various solo and group art exhibitions in Singapore and countries afar. His works have toured Southeast Asia, Japan, Europe and the United States. His artworks are valued by art aficionados and are found in the collections of national leaders, museums, institutions, as well as public and private corporations. More impressively, he was even invited to exhibit his paintings in Brunei to commemorate the Sultan of Brunei’s 47th birthday in July 1993. In recen years, his paintings are well sought-after by art collectors. Therefore, many of Choo’s masterpieces have been sold at notable public auction houses such as Christie’s International, Raffles Fine Art Auctioneers and Sotheby’s. CHIA YU CHIAN A keen observer Born in Johor in 1936, Chia Yu Chian studied at the Nanyang Academy of Fine Arts in Singapore and graduated in 1958. He was known for being the first artist from the Straits Settlement to receive a French Government scholarship at Ecole Nationale des Beaux Arts in Paris and was commissioned by the Malaysian High Commission in Paris to paint a mural called ‘Life in Malaysia’. In Paris, he was accepted for exhibitions 15 times, a few with honorary mentions by the Salon des Independent and Societe des Artistes Francaise. These achievements are deemed very impressive as his only art background then was an informal guidance under another renowned artist, Chen Wen Hsi. Throughout his career, Chia had numerous solo exhibitions and his artworks are found in the collection of various private collectors around the world, be they individuals or institutions. More impressively, prominent dignitaries such as the 11th Yang di-Pertuan Agong Sultan Salahuddin Abdul Aziz Shah, the first Prime Minister, Tunku Abdul Rahman and politician Tun Dr Lim Chong Eu had attended his art exhibitions. Most of Chia’s artworks were oil paintings and once in a while, he would resort to pastel, ink and watercolour medium. In the 1950’s, he painted mainly village sceneries, landscapes and people going about their daily routine. He was known to be the master of observation, keeping in mind every detail of what he saw. Post-1959, when he was living in Paris, his art underwent a Fauvist movement phase which had a more fluid texture, producing a piece like Paris (1961), his tribute to the French capital. He also had other attention grabbing works like PetitionWriter (1977) and ElectionFever (1978). Chia was also fascinated with the architecture of Buddhist temples, especially one that vibes such archaic power like The Temple of Emerald. His masterpiece of The Emerald Buddha Temple, Bangkok, 1972 oil on canvas depicts a scene of what goes on in a day at the sacred temple. He captured people visiting the holy sanctuary and primarily focused on the stupa, a significant feature and the focal point of the temple. There is something about his choice of colours that sends a surge of good vibes. 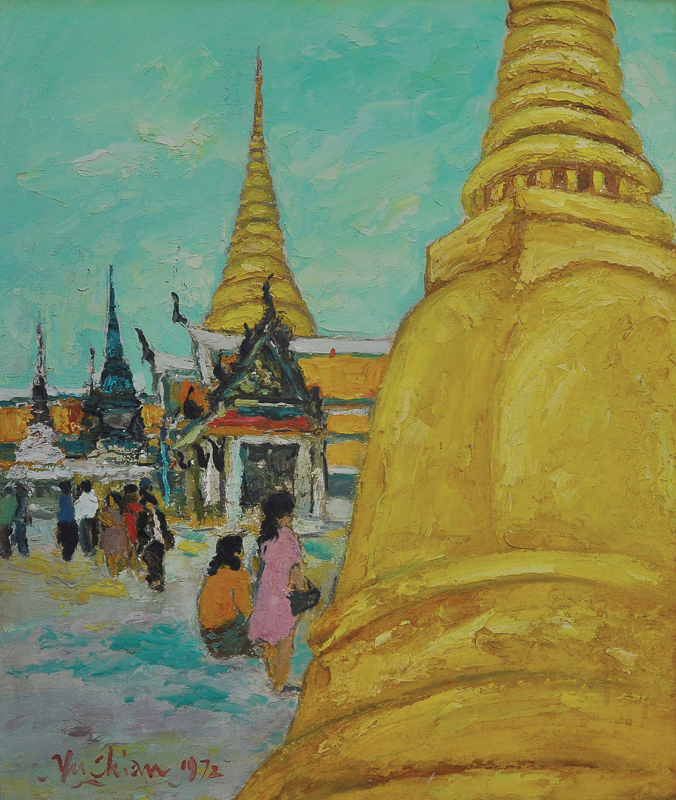 The bright sky, the golden stupas and figures in various coloured attire, he paints his subjects with spiritual optimism. In his own way, he connotes his experience of the culture and expressing them with colour palettes that not only highlight the people in the scenery but as well as the temple’s divine and grandiose topography. What is most apparent is the contrast of the different elements from one feature or figure to another which makes the painting visually brighter and more lively. Indeed, Chia knew how to channel the feel of his own experience and at the same time, illustrating the celestial motif of The Emerald Temple impeccably.